Anyone remmember 'The Statics, Luton band from 1980ish? Famous for their rendition of 'Life is like a Coke in a Mickey Mouse jar' Also Lol (Lorriane T. pictured playing Keyboards here ) talented Songwriter musician, stood in on bass for UK Decay after Martin 'Seggie' Smith left in late 1980 If anyone Has got any info or perhaps was in the band, please click the 'Post Reply' button and post a message on this thread! Hello I'm Ratty - used to be the drummer in the Statics. Nice to know someone remembers us. Would love to hear from anyone that remembers us and any band members. We had some good times - !! If possible, has anyone got any photographs of us? That was the classic line up. Have you got a copy of the three track cassette - "Electric City", etc? Do me a copy, mate. It was the best recording by any Luton group. Yes they were are really great Band! 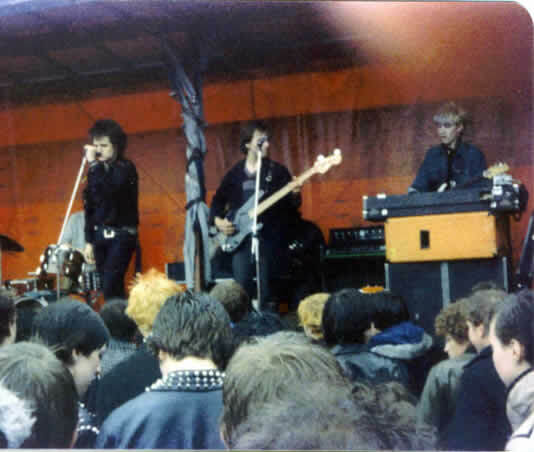 They had an indiferent attitude to what at the time was mainstream punk in the Luton Subculture, which was refreshing! And yet they retained the all important 'street-cred'! I certainly played drums after Rat. When I joined it was Debbie on Bass, Paul Mitchell on Vocals, Lol on Vocals/Guitar/Keyboards, Eric Guitar, Mark Cotterel on Sax and me on Drums. We later had another bass player, but his name escapes me at the minute (sorry). I remember my first rehersal with the band in the attic of that old church, with the dodgy floor boards that you could see the ground floor through. Someone pinched my old Electric City tape a few years back, before I could put it onto CD - so if anyone still has a copy, I would love to hear it again. Is anyone still in touch with Lol or Eric? I have many fond memroies of playing with The Statics, and a few old pictures somwhere as well. I wish I could remember more, I think I'll check in the loft for an old track list from a gig at Luton College I still have. Blimey! Mark "Gerry" Cottle on saxophone. Forgotten about that. He also roadied for UKDK. I remember he just turned up one saturday night in the Grapevine as a "punk". He'd spent the day shopping in the Kings Road! Does anyone out there have any information as to the whereabouts of Mark Cottle? he was a great fan of 'Decay' and he was once a Roadie for the band! We would be gratefull for any information! Indeed this is the line up I recall - Electric City ... what a tune!